This was very rich and filling and it seemed like a very sophisticated dish for something so simple to put together. Definitely good for company! I want to start challenging myself to cook with some ingredients I haven’t used before, so when I found this recipe using polenta I thought it would be a good place to start. If you haven’t cooked with it before, polenta is a coarse corn meal, and if you can boil water, you can cook polenta! I would definitely recommend sticking with the hot Italian sausage in this recipe, because it gave the ragu a nice kick. 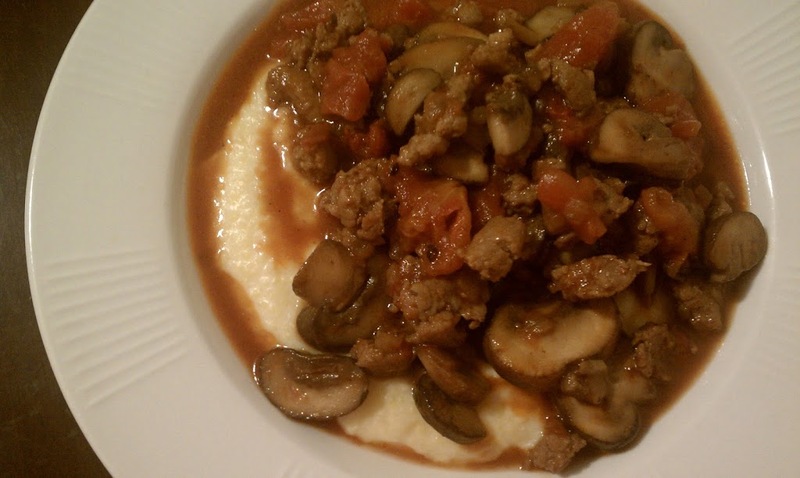 I love sautéed mushrooms and the combination with the tomatoes and sausage in the sauce was delicious and a nice complement to the rich, creamy polenta. The original serving size for this recipe in Cooking Light was 1 cup polenta with 1 cup ragu (4 servings). I love food, and I can generally eat pretty hearty servings of most dishes before I start to feel full, but there was no way I could possibly eat that large a serving of such a rich meal. I decided to make the recipe serve 6 instead, and I think you’ll find 2/3 cup of each, polenta and ragu, will be plenty filling. Add 1 ½ t olive oil to a large sauté pan over medium-high heat and swirl to coat the bottom of the pan. Add sausage to the pan and brown while breaking up meat with a spoon. When browned, remove sausage from pan. Add 1 T oil to the same sauté pan and swirl to coat. Add the chopped onion and sauté for 3 minutes, stirring occasionally. Then add sliced mushrooms and sauté 4 more minutes, stirring occasionally. Add garlic and sauté an additional minute, stirring constantly to combine. Stir in sausage, 1/8 t of salt and can of tomatoes. Bring to a simmer and reduce heat. Simmer for 15 minutes. White tomato mixture is simmering, pour broth and water into a medium saucepan and bring it to a boil. Once boiling, add polenta and stir well. Reduce the heat and simmer 20 minutes or until thick (mine was thick in a little less time), stirring occasionally. Once polenta is thick, stir in cream cheese, butter and 1/8 t of salt until thoroughly combined. Serve 2/3 c ragu over 2/3 c polenta. Thanks for sharing your leftovers. It was yummy! wow. This was really good and different. I had never used polenta before, but will use again. And I found instant polenta, so this was a quick meals. thanks. So, I was nervous about trying this because I have been chicken about trying polenta. Let me tell you, it was hard to find in the uncooked section at the grocery store (the produce man kept trying to sell me that stuff in a tube), but I finally did. I am glad that I tried it! This recipe was great and the flavors all went together very well. I ended up cooking all four of the sausages that were in my pack, and as a result added another can of tomatoes. Perfect and husband approved! Love when recipes are husband approved! Glad you tried it and loved it, thanks for letting me know!